Recently I saw a clip from a popular TV-series in which the protagonist proclaimed his maxims in life: “never take anything for granted” and “when the job is done, walk away”. I haven’t watched the program and cannot place the quotes in context, but these guidelines could be (to some extent) mine, too. I found them particularly applicable to the way I view and behave towards the book. Here, I finally said it: the book! The book – Pure Vegetarian – is about to come out, and you might be wondering why I haven’t talked about it yet. That’s because I’ve hardly recovered from writing it! The process had some elements that left me vulnerable, and I’ve needed time to evaluate everything that transpired during the past two and half years. Throughout the period I had an inner conflict between wanting to convey and being able to convey genuine and beneficial concepts within the given form. It was like a mountain I kept climbing on. Every time I reached the top, I fell down and had to regroup. Then I tried again but failed to meet the expectations again – both, mine and the publisher’s. Finally, when I handed in the umpteenth manuscript, I hastily dusted off and slid down hoping to never hear about the book again! Unlike many authors who happily chat about their work – like proud parents who introduce a beautiful baby to the world – I felt like a monster who abandoned her offspring at the publisher’s doorstep. Did I suffer from postpartum depression? Or, maybe I was just like one of those callous mommas you occasionally read about in the crime section of a newspaper! Of course it’s not fair to compare the book to any living being, much less to a baby. Pure Vegetarian was hatched and delivered in collaboration with many persons whose ideas and needs didn’t always meet; in fact, they collided at times. Everyone who has ever worked in a team knows how easily a lack of interpersonal rapport gets the wires crossed. Geographical distance, cultural differences and language barriers don’t help the situation. Somewhere on the way I decided not to obsess with the end result because there were so many factors beyond my control. Although I initially submerged into writing with a sole purpose in mind – that you would read a recipe collection and be inspired, not only as a cook, but as a wholesome person – I gradually learnt to treat the 320 page product as if it were just a tiny flavor component in a very complex soup. A set of pages had to be published because that’s what I and the editors committed to, but the main body of experience was elsewhere: it was in the attentive performance of my duty. That’s the field where I could exercise my talents in harmony with the level of my consciousness, and grow, without having to worry about whether my presentation was adequate in the scale of relative standards, trends or goals. Therefore, I placed my focus and “never take anything for granted” on the activity of writing, cooking and photographing to the best of my capacity. It was my private, profound reward none of the readers will see. Because it was so powerful, I was able to “walk away when the job was done”, too. To determine the worth of the outcome is in your hands now. You will observe it according to your knowledge base, individuality and objectives. Of course I wish you will find the book useful and encouraging. By inserting the concept of yoga cuisine, I am hoping that you will look beyond the physical, moral, and even the social implications of eating. Food is a medium for relationships: milk, butter, flour, apples, sugar, and salt are but the means to access a greater experience. Linking consciousness and cooking is not my invention, but an old discipline. The saints and sages of Vedic India, dating back thousands of years, were gastronomists who connected the physical, chemical, and biochemical nature of nourish­ment with spirituality, and associated the laws of regulating digestion with the reciprocal dynamics between material energy, living beings, and transcen­dence. For them, “life” went far beyond the body and its psychological and intellectual faculties; it included the immortality of the soul. They knew that the attitude we have while cooking, as well as the action itself, aligns with (and contributes to) universal harmony. It was obvious even for a com­moner that feeding one another was both a joy and responsibility. Pure Vegetarian will bring you closer to such a sattvik thought and lifestyle of goodness, and the practice of non­violence, ahimsa, which is a prerequisite to yogic culture and vegetarianism even today. By sharing my pilgrimage around the table, I hope to feed the insightful, blissful part of you that is hungrier for enlightenment than for bread and butter. There are 108 recipes in the book. Those of you who are familiar with Eastern traditions know that it is a sacred number. The rosary I count my meditation mantras has also 108 wooden beads. Because cooking is a type of meditation to me, I thought it was appropriate to tie the recipes into a symbolic string of beads, and devote as much care to each of them as I give to my daily series of prayers. The recipes are categorized according to the type. In the dairy section, for example, you will find homemade cheese, buttermilk, yogurt, butter, sour cream and even crème fraiche. Among the spice mixes there are sambar, chaat and garam masala. I’ve also presented a way to preserve fresh curry leaves and, as unorthodox as it is for authentic Indian kitchen, offered a curry-powder recipe so that Westerners who buy it from a shop can make it at home! For grain, rice and dal lovers there are basic recipes, but also unconventional ones, like coconut rice with saffron, green mung beans with fennel, quinoa kitchari and savory semolina porridge. The vegetable dishes include beetroot kofta, oven fried bitter melon crisps, pumpkin and spinach curry, and Bengali-styled vegetables in mustard-seed sauce. Some of the preparations – like baby potatoes in yogurt and tomato sauce, and spiced green beans – are quite piquant, and others – like Brussels sprouts in sour cream, and cauliflower and coconut curry – are mild. I demonstrate how to make different kinds of flatbreads, Indian crepes, spicy lentil doughnuts and other side-dishes, snacks and party munches. There is also an introduction to growing seedlings and sprouts, and picking wild flowers for salads in the book. If you have a taste for a little bit of heat, I’ve presented various chutneys made from nuts, berries and fruits. And, if you still grave for hotness, you will find a recipe for a quick eggplant pickle. Then, the desserts will take you around India from Braj, where thick milk-sweets are cooked down for Sri Krishna’s pleasure, to the coastal town of Puri, where the Lord of the Universe enjoys, with a wide smile, burnt cheese and molasses cakes in an ancient Jagannatha Mandir. You will visit an aristocratic Bengali tradition of making steamed cheese pudding, and sense the royal opulence of Karnataka by tasting a melt-in-the mouth candy, Mysore Pak. When you are about to twist your tongue with exotic names – Kheer, Kalakhand, Bhapa Doi, Gopinatha, Laddu, Amrakhand and Sandesh – you may take a break with ice-cream, peach pie or energy bars! 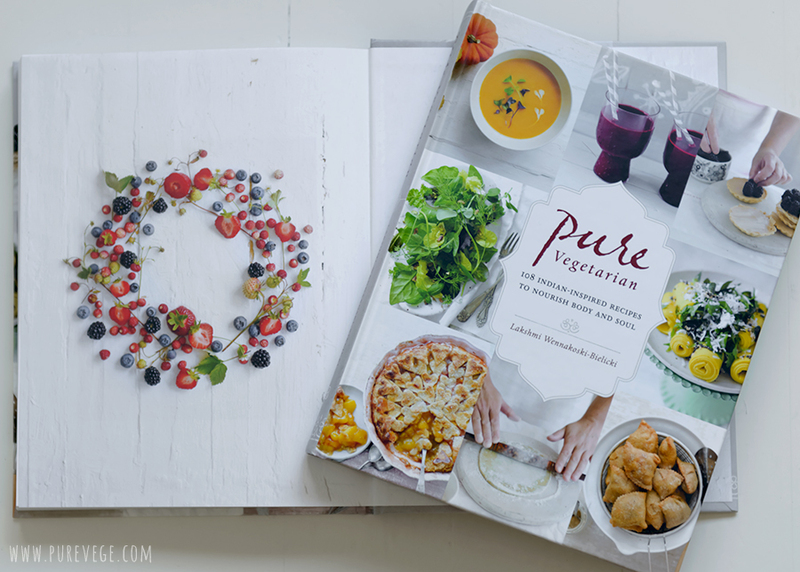 One thing is for sure: you won’t be deprived of sweetness while browsing through Pure Vegetarian! Should you decide to walk on the healthier side of life, I recommend you to skip the syrupy temptations, and make a cup of yogi-tea, green smoothie, beet and carrot juice, or a refreshing lime and cucumber drink as shown in the end of the recipe section. In addition to all this, I’ve also itemized my kitchenware to give you an idea of which utensils and appliances are practical to have on hand, and included a conversion table to help you change any volume, weight, or temperature into your standard unit. I’ve also taken time to consider the connection between food and hospitality, culture and etiquette, and composing and serving a meal. If you find anything valuable in the book, apply it to your life and pass it on to others! You can also order the book via any bookshop around the world by the ISBN: 9781611801446. My husband and I were sitting in the garden this morning, eating fruit salad, when a post-office vehicle turned in the front of our house. The driver pulled out two large boxes and an envelope. I signed the delivery-sheet while thinking that my internet-shopping must be getting out of hand because I don’t recall ordering anything of this size recently! What is in the boxes? When I saw the United States Postal Service stamps I realized the books have arrived! We both grabbed a book, sat down and started to read. After an hour or so, we looked at each other and smiled. My husband said: “I always knew the book would be like this; it is wonderful”. He saw the final content for the first time, and he liked it! We both became hungry after browsing through the pages and went inside to cook. Whatever trials I had while writing, cooking and photographing for the book were there to mold my character and keep me sincere. I am very grateful for them now. Shambala / Roost Books, and especially Rochelle – my editor – has done a beautiful job making Pure Vegetarian so soothing and wonderful experience to read. I have no complaints. I love the book! Dear Vera, thanks! It would be so nice to meet one day - finally! wow!! - your words are amazing, the photos wonderfull!! - i look Forward to adding your book to my collection! Congratulations on the delivery of a very healthy book. Peace to you as you recover . . . truly. For years I've enjoyed your blog posts, which have blessed me to be more mindful and meditative in the kitchen and in life. I am looking forward to holding a tangible hardcopy of your encouraging words to enjoy, and from which to be inspired . Thank you for your kind encouragement. You have hit the core of humanity for we are here to enlighten and help one another to evolve. You can find something valuable even in an unworthy place, like you have done here, because you are open and willing to see goodness even when there is none. Just like a copper wire has an inherent ability to transmit energy, any of us may become an instrument of light under proper circumstances. Just lovely. What you said about the copper wire reminds me of a delicious line of poetry, penned by one of my favorite poets, Galway Kinnell, which I keep in my spiritual hope-chest, "think of the wren, and how little flesh is needed to make a song." When I feel utterly depleted, and incapable, I often think of that . . . we don't need much to create beauty. Now, I will add your copper wire analogy to my hope-chest. Thank you. Again, I'm looking forward to receiving your cookbook. This is fantastic, Lakshmi! My copy is on pre-order and I cannot wait for it to arrive and to start cooking from it! Congratulations! Wow, what a journey this book has been for you! Thank you in advance for all the effort you put into the details of this book. Just ordered mine! Dena@GatheringFlavors. You have a wonderful site and very beautiful fotos! You can order it from Amazon, for example: http://www.amazon.com/gp/product/1611801443?tag=randohouseinc7986-20 My husband will come to Warsaw in August, he might be able to bring you a copy, too. Please send me a private message (laksmi@purevege.com) if you are interested. Lakshmi, I sent you an e-mail. You got it? Ananda, I didn't receive your e-mail. Lakshmi, I am sorry that my email do not reach. Maybe you write to me? wedyjska.kuchnia@gmail.com. I really want to buy your book autographed. If your husband will be in Warsaw, I can drive up to it for the book. Please email me so I can send you my phone number. I intend to get several copies of your book as gifts for dear friends who will LOVE it! Thank you so much for all the sacred energy you put into your work - it is really a blessing for us all I feel, at least especially for me. Thank you! Elle, thanks for the comment, and also for the link. I read the post with interest. Her experience helped me to understand my experience better, too. I hope you will like the book. Oh Dear ! I have to wait another 2 months in France to get the book. But patience is good and I will wait. And surely prepare in advance to eat an inspiring meal after plunging into your pages. Best and all the best to you. Really, 2 months? Why don't you order it online before that? They will be shipping the pre-oders already in July. Some have already received the book. Congratulations Lakshmi.You have an amazing gift of taking very difficult topics and explaining it in an easy way. love your photography too. You are my hero. Congratulations! I can't wait to read your book. Your photos are stunning. Welcome back, my dear! I heard you had a quite an adventure up in the Himalayas! Very exciting! I hope to meet you soon and hear everything about your trip. Congratulations!!!! I'm so so excited to order my copy...it looks and sounds absolutely delicious! I really LOVE the pictures! Nice work! Hei Lakshmi, congratulations for the big work! And more to come.... Can't wait to get my hands on it. I had your problems already in my mid twenies and I had to make clear chooses to find a diet to stay in some kind of decent shape; no cheeses and bread home, very low carb intake, instead home made plant based whole foods. In this respect I'm just super glad finally find this kind of light, fresh inspiring recepies from your blog. This is something that will really be dearly welcomed and used in my kitchen. Regarding your work here in the blog and the newly started work as book writer: what could be more interesting and needed- your deep personal insight, your experiments and experiences with food and nutrition, the health dimensions of it, your wonderful photography... It makes these necessary, lighter and delicious steps so much easier for so many. Can't wait what will be coming up. THIS is the real God's blessing :D. Your work is much needed. Dear Alma, thank you for sharing your mind. So much is happening in my life right now and I’m very much behind in updating the blog, but I hope to be able to offer content that will also benefit you in the future. I wish I had been as sensitive to my nutritional needs 10 years ago as you are! I’m glad you’ve received the book. Please let me know what you think about it later, you always give insightful feedback. Dena, I saw your book review on Amazon - thank you for your generosity. It was very kind of you to take time and share your thoughts with others. Jill, nice to hear. Thank you. Dear Jill, thank you for your feedback; it makes me happy and grateful to know that the book resonates with you. You are absolutely right, letting go changes the way we see. Lakshmi, you have created a beautiful book. Is it available in e-book format? And if so, where can I get it? Dear Uma, it's available only as a hardcover.